Morphy Auctions’ February 2017 Premier Firearms Sales Event to Feature An Outstanding Selection of Antique and Modern Handguns, Rifles, Shotguns, Knives, Militaria, and Historical Ephemera. This world-class, three-day auction event offers collectors over 1,950 lots across all collecting categories and price points. 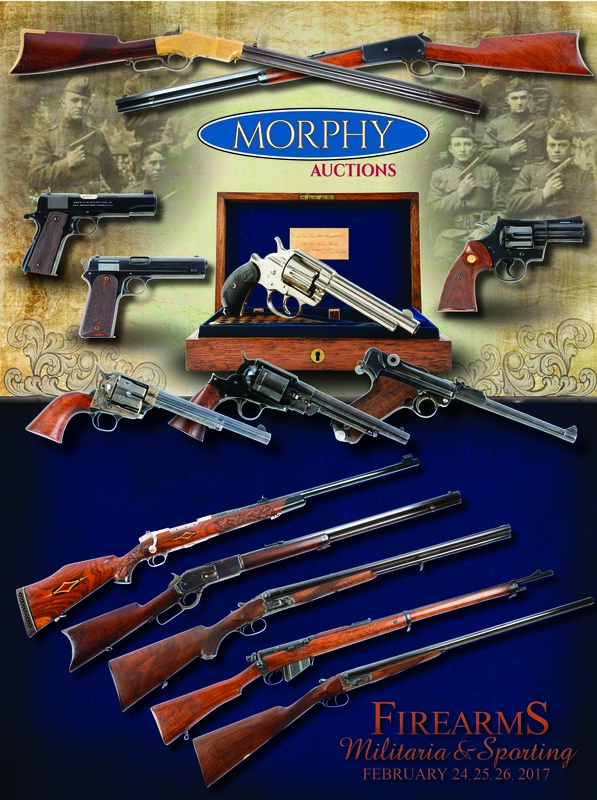 Morphy Auctions is pleased to announce its upcoming Premier Firearms sales event to be held on Friday, February 24th through Sunday, February 26th, 2017. All lots from this upcoming sale are on display in Morphy’s Denver auction gallery and available for preview now. This fine sale represents Morphy’s largest and most diversified sale of firearms and early Americana to date. Day 1 kicks off with a premier offering of European and American militaria, uniforms, edged weapons, medals, hats, helmets, and bronzes. We have one of the largest offerings of Olympic style target pistols, most from a single owner, to include Hammerli, Unique, Feinwerkbau, Walther and Pardini, along with numerous military long arms, to feature a near mint Remington 1917 Mosin Nagant. Day 2 kicks off with a strong collection of high condition pre-war Smith & Wesson revolvers. Also notable is the largest single offering of King custom target revolvers. There is a vast array of fine Colts to include an unfired English cased Colt Model 1878, an unfired Navy shipped pre-war Model 1911-A1, and a high condition Colt 1891 S.A.A. cavalry revolver. German military is well represented with a fine single-owner collection of rare and high condition Lugers to include: Persian Artillery, Persian Cutaway, Krieghoff, Simson Suhl, Vickers, and rare foreign contract guns. We have one of the elusive Sauer cased Luftwaffe Drillings and a bevy of assorted pistols and longs arms. One of the highlights of Day 2 is the finest and largest offering of early Weatherby rifles ever presented, with numerous deluxe, Crown Grades and pre-Sauer examples. As usual, we are offering some outstanding lever action rifles that are highlighted by one of the rarest Model 1886 models in .50 caliber smooth bore with complete historical reference. Also included is a fine engraved Martial Henry, a fine 1876, a high condition 1866 musket, along with some early high condition Savage Model 1899s. For the Remington collector, we are offering a desirable J.P. Lower stamped 1901 target pistol in .44 Russian and a rare Rolling Block No. 1 Adirondack sporting rifle. If you are a lover of fine shotguns, it doesn’t get any better than a cased Royal Grade Holland & Holland two-barrel set, along with numerous English doubles that include Purdey, W.C. Scott, Greener, along with some incredible Belgian Brownings. Day 2 will also be memorable for the extensive and well-known Dan Hartzler collection of silver hilted swords, all of which are featured in his book American Silver Hilted, Revolutionary and Early Federal Swords, with nearly 40 exquisite examples, many American silversmith marked, along with two exquisite Philadelphia silver hilted swords with repoussé scabbards. The Michael Kvietkauskas collection is simply breathtaking and features fine Revolutionary War and earlier powder horns, knives, muskets, important documents and art; this collection comprises over 200 lots of some of the finest, early Americana that has ever been brought to sale and offers a once-in-a-lifetime opportunity. Being located in the heartland of Amish populated Pennsylvania, we continue to bring some of the finest Pennsylvania long rifles to market and this sale includes nearly 50 examples with many museum quality pieces. Represented by such makers as Moll, Kunz, Schuler, and Mauger, many of these Golden Age rifles feature relief carving and ornate inlays. While not steeped in history, the Colt Python has, none-the-less, become an American icon. To that end, we have over 15 high condition examples, many boxed, to include two rare factory lettered 3” Models. Day 3 is a wonderful mix of collectible firearms and a nice assortment of weapons earmarked towards hunters and collectors alike. This spectacular three-day event will shine regardless of the weather, making South Central Pennsylvania the finest mid-winter vacation destination for firearms enthusiasts everywhere. We hope to see as many of our old friends and some new ones as possible, but as always, if you can’t make it in person, our internet and call-in service is second to none and the next best thing to being there.